A Chat With Mr. David Benedek, the man behind BDK Perfumes. 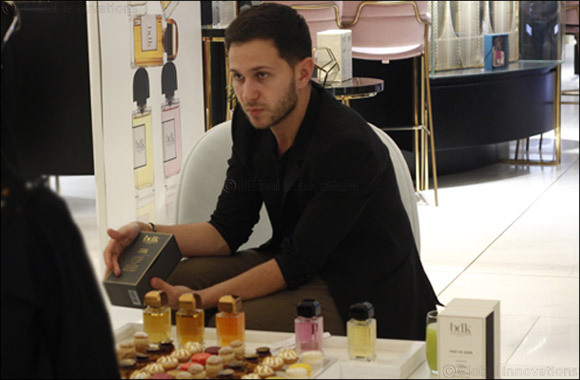 I was invited at Robinsons, a Luxury Shopping Destination, to interview a very dynamic, enterprising, enthusiastic and probably the youngest perfume designer- Mr. David Benedek. Mr. David(BDK) has his very own individual perfume house that is based at that Palais Royal, Paris. He demonstrates a strong passion about his work. Furthermore, he grew up in a perfume heaven (Perfume shop in Paris) with his grandparents and parents owning a perfume store. Later, he went on to study Economics and Management. Eventually, his passion drove him to specialize in the field of perfumery and cosmetics. BDK prefumes are known to be long lasting and mostly loved by both men and women. Q) What inspires you to work towards creating certain fragrance? A) My city Paris and its people. Paris is very close to my heart and everything, everyone in it inspires me. At BDK we like to work with flowers. I love Tuberose and Jasmine. Jasmine from Egypt and India are the preferred ones. Pear is my favorite ingredient, it helps to highlight the other ingredients. Perfume bottles were inspired by the Louvre Museum, the cap of the bottle is a replica of the Dome. 'Simple is Chic' is my mantra. Q) How is the response in the Arab Market? A) (Very humbly) I am quite new, as BDK is in the market just one and a half year old but the response from the gulf market is very encouraging. Since, people in this region have a eye for chic and classy products. Three out of five of my perfumes are already the best sellers. Pas Ce Soir, Bouquet De Hongrie and Tubereuse Imperiale are very appealing to my customers at the moment. Oud Abramad and Wood Jasmine are very particular, they need to be tried on the skin. Q) How do you make your perfume last longer? A) Quality of the raw material is very important. I am very careful while picking up ingredients from all over the world. This year rose was really good and am very particular. The way we work is very different, it is the 'Old School' method that we follow, the way perfumes were made in the olden days in France that made them niche and stand out. Q) Any special information you would like to provide to our readers? A) I will soon be coming up with two new fragrance by the end of February, Oriental and Parisian. Oriental will be a work around fresh white leather, a combination of freshness and leather notes. Parisian will be a tribute to the elegance and sensuality of a Parisian lady.